Help End Hunger In Northwestern Ohio. One-in-six adults and one-in-four children face hunger in our community. Every $1 donation provides 5 meals through our network of approximately 250 food pantries across 8 counties. The Toledo Northwestern Ohio Food Bank depends upon donations from the community to aid us in our continuing fight to end hunger in Northwest Ohio. Hunger is a problem that affects families year-round. The Food Bank secures and provides food for families struggling with hunger; operates programs that promote self-sufficiency among the people we serve; educates the public about the problem of hunger; and advocates for legislation that protects people from going hungry. 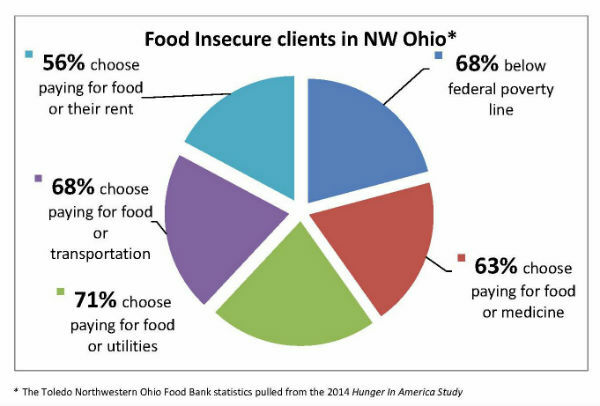 All funds stay in Northwest Ohio to support our critical mission to end hunger. Over the past 30 years, the Food Bank has distributed over 100 million pounds of food and grocery products to our member agencies. Currently, the Food Bank serves approximately 250 non-profit agencies in an eight county area that includes; Defiance, Fulton, Henry, Lucas, Ottawa, Sandusky, Williams and Wood. Thank you for your work in keeping children from going hungry!